Please join us for Stations of the Cross at 11:00 on Thursday. The students will be dismissed at 11:30. There is no school on Friday. The next Blog will be published on Saturday May 4. Titanic Narratives: Students are writing their final drafts of their Narrative Biography. They have done a great job researching and writing fabulous and suspenseful stories full of historical fiction and fictional versions of themselves! Come read them in the hallways, as everyone’s is unique. We will also work on a couple other Titanic related articles this short week as we wrap up this fun unit. Bushels of blue berries, fields of corn, self pollinating we will find out some interesting facts this week about what is important in everyone’s state. If you travel this next week ask the question on how big is an acre of land or how many acres do you think a state has planted? We will be working on the state symbols pages of the State Fair project this week. The Wisconsin focus will be on creating a timeline of the early people. There will be an Early People of Wisconsin wrap up, open note quiz on Tuesday. We will review in class on Monday, so the students should be in good shape! There will be no Daily Geography this week! This week we will finish up the unit on multiplying and dividing fractions. We will have a pretest on Tuesday and a test on Wednesday. Because of the early dismissal, there will be no math on Thursday. Vocabulary: Chapter 14 test Wednesday. Books will come home Monday to study. Spelling: No lesson this week. Grammar: Unit 4: Adjectives, Adverbs, and Prepositions. Writing: Prayers for Lent, Titanic Narrative final draft and Persuasive Writing tied to Titanic unit. Venture Magazine-Lenten Journey in conjunction with our writing journals. Every week we are gathering with the intermediate kids to pray a decade of the rosary in church. One of our commitments to pray more during this holy time. 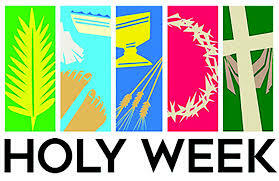 This week we will pray together as a class The Stations of the Cross.